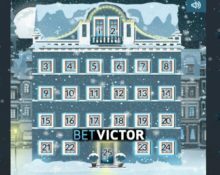 BetVictor – Christmas Calendar | Week 4! Enjoy the final week of festive treats! Season celebrations are turning onto the final stretch at BetVictor with tons of festive treats for the Casino, the Live Casino or on Sports going to their loyal players for another 8 days. There is more to come until Christmas Day as players can look forward to offers for Free Spins, Deposit Bonuses, Free Bets, Tournaments, 2 Prize Draws for holidays and so much more. Make sure to log in every day to open the next calendar door for your festive surprise. Game of the Week Prize Draw – Every week BetVictor is selecting one slot as “Game of the Week” and puts up a £/€ 5,000 prize pool in cash and bonuses that will be raffled off to 100 lucky winners every Wednesday. For this week they have chosen Renegades. Earn one entry to the prize draw for every £/€ 10 wagered on the game from Wednesday to Tuesday. Amount of tickets per player is unlimited. The crew at BetVictor assembled for this year yet again a superb festive Christmas Calendar where players can open a new door every day to reveal sweet treats such as Free Spins, Deposit or Wager Bonuses, Free Bets, Raffles, Tournaments and more. Make sure to log-in every day to reveal the next offer. Standard wagering requirements are 35x bonus and 30x FS winnings, unless otherwise stated, subject to the BetVictor casino bonus terms and conditions. Free Bets and other sports betting bonuses may have wagering attached, subject to the Sports bonus terms. Wager £25 on Live Roulette and £25 on Live Blackjack to be entered into the £1,500 Prize Draw. A total of 29 cash prizes ranging £25 – £500 will be randomly credited to winning accounts on 19th December 2017. Play on Xmas Joker and Merry Xmas to earn 25 points for every Bonus/Free Spins feature and race into the TOP50 on the leader board. Prizes are £500 in cash for first spot and £25 – £200 bonus for 49 runners-up players. Wagering requirement for the bonus prizes is 20x bonus amount within one day, subject to the BetVictor casino bonus terms and conditions. Earn on ticket to the raffle for every £5 wagered on Secrets of Christmas™. Prizes ranging from 50 – 500 Free Spins will be randomly awarded to 100 accounts on 21st December 2017. Wagering requirement is 10x FS Winnings within one day, subject to the BetVictor casino bonus terms and conditions. Deposit minimum £10 to receive a £20 bonus that can be used on Genie Jackpots only. Wagering requirement is 30x bonus on the selected slot only within one day, subject to the BetVictor casino bonus terms and conditions. Open Fruit Shop Christmas Edition to play 20 Free Spins, no deposited needed. Wagering requirement is 25x FS Winnings within one day, subject to the BetVictor casino bonus terms and conditions. Deposit minimum £10 to instantly receive a 50% match bonus, up to £100. Wagering requirement is 35x bonus within one day, subject to the BetVictor casino bonus terms and conditions. Log-in today to claim your £10 Christmas bonus, no deposit needed. Wagering requirement is 35x bonus within one day, subject to the BetVictor casino bonus terms and conditions.